Charming and bittersweet, this modern-day romantic comedy starring Uma Thurman, Janeane Garofalo and Ben Chaplin explores the beguiling perils of mistaken identity. Abby (Garofalo), a savvy, witty veterinarian who hosts her own radio talk show, is anything but confident when it comes to love. A petite brunette, she describes herself as tall and blonde when Brian (Chaplin), a caller who is smitten with her radio persona, asks her on a date. She then talks her tall, blonde neighbor Noelle (Thurman) into assuming her identity, setting off an escalating series of hilarious and romantic crises. DVD: Widescreen 1.85:1/16x9; audio English DD 5.1 & Dolby Surround, French Dolby Surround; subtitles English, Spanish; closed-captioned; single sided - dual layered; rated PG-13; $24.98; street date 4/17/01. If nothing else, my recent screening of 1996’s The Truth About Cats and Dogs benefited my own pooch. At one point, a character states that dogs love to have the tips of their ears rubbed, as these “acupressure” points feel good to them. I tried it, and darned if Oat didn’t respond favorably! Granted, this dog craves all forms of petting, but I was still happy to add something new to my repertoire. Other than that, I’m not sure I got much from Cats. I’d seen the film during its theatrical run and vaguely recalled positive sentiments toward it, but my second screening of the flick seemed less enthralling. The movie plays as a modest variation on the Cyrano theme. Abby (Janeane Garofalo) is a bright, funny and successful host of a radio show about pets, but she suffers from severe insecurity in regard to her physical appearance; she’s quite convinced that she’s a dog herself, and this definitely affects her romantic life. When she helps a mildly-awkward but charming photographer named Brian (Ben Chaplin) tame a misbehaving dog on roller-skates, he asks her out on a date. In a fit on panic, Abby claims that she resembles a tall, thin, gorgeous blonde - a description that matches her neighbor Noelle (Uma Thurman). From there a dual romance begins, as Brian physically goes out with Noelle but has long, provocative phone chats with Abby. All along he thinks they’re one and the same, but many clues indicate otherwise. Nonetheless, Brian’s too dense to pick up on these, though I can’t blame him. He seemed to have it all, as the combination of Abby’s wits and Noelle’s looks make them the perfect woman. Inevitably, many comic hijinks follow along the way until the truth is ultimately revealed. Although Cats only came out five years ago, the film seemed surprisingly dated. It has “mid-Nineties” stamped all over it. There’s the faux-Hootie soundtrack, plus a general feeling that matches the era. I wish I could better explain why I felt the product seemed so indicative of the times, but I can’t quite put my finger on the specifics. I guess you’ll just have to go along with me this time! Anyway, Cats provides a moderately entertaining experience, but it was slightly sabotaged by its cuteness. Perhaps that’s the aspect that dates it so badly; it features a gently bemused tone that lacks edge and indulges in excessively adorable aspects. Brian is from the Hugh Grant mold, as he seems moderately flustered some of the time, but in that Grant manner that seems to delight women. He’s the perfect mid-Nineties male: charming, handsome, and absolutely unthreatening. Chaplin seems adequate for this neutered role, but he doesn’t do much beyond its restraints. I like both Garofalo and Thurman, though neither did much for me here. I must admit I dislike the entire premise behind Garofalo’s character, as she’s yet another alleged skank who really isn’t unattractive. No, Garofalo can’t compare to the dazzling beauty of Thurman, but she’s fairly cute on her own. Perhaps someday Hollywood will cast an unattractive person in the role of an unattractive person, but it didn’t happen here. Nonetheless, Garofalo seems appropriately insecure and still charming in the part. She makes Abby likeable and winning but refrains from becoming excessively terrific; we have to understand her insecurities better than that. Thurman is an underrated actress who does quite well in this supporting role. Noelle isn’t given much good material, but Thurman makes the best of it, and I found her to be quite charming as usual. Still, the overriding cuteness of Cats made it only a moderate pleasure. I didn’t dislike the movie, but I thought it dragged much of the time, and it failed to offer much spark of life. Really, it was little more than a glorified sitcom episode, as the humor stayed within those gentle and banal walls for the most part. The Truth About Cats And Dogs is a safe bet for guys who want to look good for their female significant others, as it’s modestly enjoyable but still quite palatable for women. However, don’t expect much more from it. 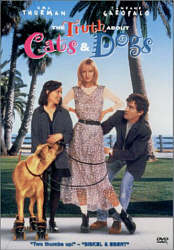 The Truth About Cats and Dogs appears in an aspect ratio of approximately 1.85:1 on this single-sided, dual-layered DVD; the image has been enhanced for 16X9 televisions. While not a terrible picture, I thought the image seemed surprisingly bland, especially considering that the movie itself is barely half a decade old. “Bland” was the word of the day when I watched Cats. Sharpness appeared decent at best, as the film presented quite a few soft sequences. While these never looked absurdly fuzzy and unfocused, I still felt that much of the film lacked the crisp and distinct qualities I would expect. Most of the image seemed adequately defined, but the softness interfered on many occasions. No moiré effects or jagged edges appeared evident, and print flaws were minor. I detected occasional examples of a little grit and speckles, and a few nicks popped up as well, but for the most part the image seemed clean. Colors fit in with the rest of the package, as they usually looked rather drab and ordinary. Some pale qualities appeared, but for the most part the hues seemed acceptably accurate but simply flat and lifeless. Black levels were also a bit bland and unexceptional, and shadow detail looked adequately visible without too much excessive thickness. Low-light scenes suffered more from the dull blacks than from other concerns. Ultimately, Cats stayed watchable at all times, but I thought it seemed awfully mediocre. Similar comments apply to the film’s Dolby Digital 5.1 soundtrack. As one might expect from a romantic comedy, one won’t find much activity from the soundfield. The mix stayed very strongly within the front speakers, where I heard decent stereo separation for the music and a modest spread to effects. Most of the activity remained in the center, though, as the sides were used for little more than some music and light effects. The same went for the surrounds, which provided only mild activity. I heard some music and general ambience from the rears, but that was about it. Audio quality was passable but also bland. Dialogue could sound somewhat thick and metallic at times; the lines remained clear and intelligible, but they lacked the natural qualities I’d expect. Music seemed fairly bright and offered modest depth, while effects were acceptably accurate and realistic, though they didn’t stand out in any way. Frankly, this was a somewhat lifeless mix that failed to provide much depth or range. It felt acceptable for this sort of film but still was pretty drab. Less exciting are the DVD’s supplements. All we find are a slew of advertisements. There is the theatrical trailer for Cats plus two TV spots for the film. In addition, the “Fox Flix” area provides trailers for Working Girl, Norma Rae, 9 to 5, Nine Months and For the Boys. That’s a lackluster complement of extras for a drab DVD of an ordinary film. The Truth About Cats and Dogs offers some humor and charm mainly due to its two female stars, but they’re often buried underneath the movie’s excessively cute and cloying characteristics. While not a bad flick, it seemed fairly unspectacular and ordinary. The same went for the DVD itself, which gave us pretty average picture and sound plus no significant supplements. At best, this one’s a rental for guys who want to look sensitive and accommodating for their women; I’m not sure the females will dig it much more than the men, but it’s the thought that counts!